I want to actually release this hours ago but then there was this sudden hotel meeting I need to participate, so it get delayed so late in the night (here is midnight right now). On the day when Elfrieden Kingdom’s (Temporary) King, Souma, accepted his Second and Third fiancées, there were two people conducting a discussion through the Royal Voice Broadcast at a different place. Elfrieden Kingdom’s Prime Minister, Hakuya Kwonmin, addressed Jeanne Euphoria, the Sister Princess of Maria, the Empress of the Grand Chaos Empire, and who was reflected on the simple receiver set atop the table. Jeanne made a sweet grin on the screen. 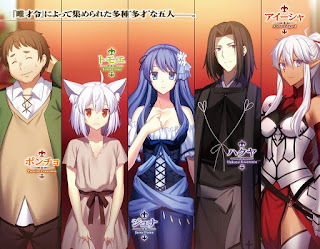 After the Amidonian Conference, Jeanne returned to her country and reported to Empress Maria about the proposals from Souma: 『The Secret Alliance with Elfrieden Kingdom』, 『Establishing a Bilateral Hotline』, 『Each country dispatching a residing Ambassador Extraordinary and Plenipotentiary and establishing an embassy as the place where the ambassadors will stay』. Jeanne had thought that Maria might not refuse these proposals and, sure enough, Maria readily consented to it. Or perhaps, it could be better to say that she was laughing exuberantly. The one who pursued the ideal and the one who looked at the reality, not only were they separated geographically at the eastern and western sides of the Continent, but were also separated by their ideology, but for some reason, both of them could understand each other. Certainly, it might be an interesting situation, thought Hakuya. Then, after a bit gossip (expressing complaints about their respective Lords), Jeanne asked Hakuya. Jeanne was opening her eyes wide in surprise at the sight of Hakuya’s loquaciousness. If you were talking about the “Black Clothed Prime Minister”, then he was someone who was famous as a genius that Souma had discovered and a person who led Gaius VIII and Julius by their noses with his Machiavellianism. When she personally met with him, Jeanne also had the impression that he was a really clever person. However, when Hakuya was talking about books, he had the eyes of a child. This gap (Hakuya’s attitude that was different from his usual demeanor) left Jeanne in a bit of shock. When he heard Jeanne ask this, Hakuya’s ego returned. His expression recovered back into his usual cool and composed one, but the tips of his ears were a bit red. In the first place, Hakuya’s audience with Souma, was just because his Father uncle said 『Don’t just spend years reading books! Go out and help society!』 and involuntarily registered him at the Talent Event’s 『Wisdom Talent』 class. Then, he, the overall champion, had an audience with the young king and was charmed by him. Hakuya thought that if it was Souma, then he could make this nearly dying country get back on its feet again. So he stopped being a reclusive bookworm, became a government official, and before he noticed it, he had already become the Prime Minister. As a matter of fact, at that time Hakuya thought that it would already be good enough if he became an advisor to the previous Prime Minister Marcus. However, that Marcus saw that Hakuya was more Prime Minister material than himself and recommended Hakuya as Prime Minister. Thanks to this, recently Hakuya didn’t have any time to read the books that he liked and his days of being pressured by work, continued. But, you know…… These work pressured days are also not bad, thought Hakuya. The former Hakuya would think that history was only something that existed inside a book. However, currently he felt that he was making history himself. By serving under Souma, who will lead the Era of this country, Hakuya himself could become a character in the history. When he thought about this, it didn’t sound bad. What Jeanne said might be true. In this Era, it is hard to have a comfortable retirement. Between the threat from the Demon Lord’s Army from the north, which was gradually approaching, and the Alliance, which member countries had their own agenda, it was a hostility filled situation. Hakuya must settle these situations entirely for the sake of his comfortable retirement. Whether or not this is possible, it was something that was beyond his knowledge though. In the corner of the room, there was a kneeling man clad in black attire. His face was shrouded by a veil of black cloth. It was as if he was melting into the darkness of the room, the light dimmed behind its closed doors. Hakuya asked that man. When the man hesitated to answer, Hakuya knitted his brow. Hakuya dismissed the man and turned the pages of the book in his hand. Why did he take custody of the books from Amidonia’s Library as the indemnities’ collateral? It was because Hakuya was expecting something. That is, the chance of the neglected book collection containing books about Amidonia’s family registry or legal jurisprudence. Since the Capital’s Library was usually supplied with copies of these kind of books, if he could obtain those book copies, then it will be as if he had grasped the heart of that country. Since the Amidonian Royalty was War-Hawkish, he had expected that they wouldn’t recognize its importance. However, contrary to his expectations, amongst the confiscated books, there was only a single copy of that type. That copy was what Hakuya was holding right now, a book about the current generation’s Amidonian Royalty’s genealogy. He turned the pages and when he arrived at the last page, there was a folded up paper interposed in it. Hakuya unfolded that pages and what he found was a picture of “a small animal with black fur around the eyes and round ears, pulling its eyelid with one hand while sticking out its tongue”. Seeing this picture, Hakuya was blinking his eyes in surprise, while laughing, “kukuku”. Also, the stage for Roroa’s appearance is close! A realist (Souma) and a capitalist (Roroa), how will these two interact? Also, what are Hakuya’s Man In Black Agents doing? Also there is no funny Author Notes for this chapter. Read the next chapter at Larvyde! A. As ‘Kurogo’: The stagehands in traditional Japanese theatre (Kabuki or Bunraku), who dress all in black. In kabuki, the kurogo serve many of the same purposes as running crew. They move scenery and props on stage, aiding in scene changes and costume changes. They will also often play the role of animals, will-o-the-wisps, or other roles which are played not by an actor in full costume, but by holding a prop. Kurogos wear all black, head to toe, in order to imply that they are invisible and not part of the action onstage. As this convention was extended to kabuki actors depicting stealthy ninja, the stereotypical image of a ninja dressed all in black might be derived from kabuki. In Bunraku, the people who played the dolls are also wore black clothes. This term could also be used as in a figurative way to refer to an ‘unsung hero’ (since stagehands are important yet they are not part of the story). But it also could mean a doll-master (string-puller for Western equivalent), that is a person who does things without being ‘seen’ by the public, mostly involving a puppet front. In this meaning: Hakuya is the ‘stagehand’ who is not ‘visible’ to the ‘public’ yet was the one who moves things around. The stagehand for Souma in the stage. B. As ‘Kokui’: The black clothes that are worn by Buddhist Priest. In Japanese History, some Buddhist Priests that held a lot of secular world influence (politically) are also called: 黒衣の宰相 (literal meaning: Black Clothed Prime Minister), which, intentionally, also is Hakuya’s nickname. Yet in Hakuya’s case, I believe it was because he is a Prime Minister who did many things in the back. Or because of his usual dark attire. Or because of his “Man in Black” subordinates. Before the era of rapid international transport, or essentially instantaneous communication (such as the telegraph in the mid-19th century and then radio), diplomatic mission chiefs were granted full (plenipotentiary) powers to represent their government in negotiations with their host nation. Conventionally, any representations made or agreements reached with a plenipotentiary would be recognized and complied with by their government. This might change when the communication device based on Royal Voice Broadcast Orbs becomes widespread, though. Also known as Gap. For example: Gap-Moe is that moe feeling you experience when a character acts in way that contradicts the way he/she usually acts. Mostly a tsundere trait. Want to write: “Make Elfrieden Kingdom Great Again”. But I guess everyone is tired from this joke. Like contracts or other legal rules. Imagine what would happen if China or Russia held USA’s citizens registry, government copies of legal jurisprudence, or other classified information. Also, in case no one realize. The animal implicitly referring to Roroa is either Tanuki / Japanese Raccoon Dog or Raccoon, both is considered to be mischievous and trickster in Japanese and Native American folklore. Since this is Japanese story, perhaps it is Tanuki. Dang it! Make it a personal union, Souma! Compared to the descriptions, that Poncho looks... almost slim. I guess he was overweight by the standards of the era, but not as much by our standards. Considering that he traveled far and wide in search for food in which case involves tribes unreachable by carriage, this appearance of him suit him quite well. Then Juna looks is Itsuka Shidou from DAL. actually, I hope there will be shimaidon with Soma, but oh well, Hakuya x Jeanne is not bad. also, who is that person Soma mention when he talk with Carmine? I think it wont be answered in the near chapter. Can't help but think it's the previous king. My hunch is right, I think 'that person' can't be new character, so the only chance is King, Queen, Marcus or Hakuya, and the most probable is the Queen because Liscia said that there is three people she can't win, Her maid, Carmine, and Her mother. we had seen two people in action, just queen that haven't. Juna - resembling Alicia of the ARIA series, kind oneesan but without a hint of being a pushover. the one in the illustration feels too soft. I'd like to know what you guys think, though. I think they fit their description on their introduction, since that illust is their serious mode, probably. And given that Poncho able to travel around the kingdom, i don't think he can be any fatter, and he's just sweating oil when he's nervous at his first audience with Souma. Thankee very very much for the chapter!!! I think its that runaway princess who did that. Poncho is a lot thinner and normal than I thought. It doesn't reflect the characteristics portrayed before and I would doubt if people would even laugh at him when I believe some nobles would be even fatter. I imagine Roroa look like Motoyasu from Oda Nobuna no Yabou. A king marrying up into an empire? Most likely a matrilenial marriage or they won't accept it. Deus vult. Thanks for new chapter. Next chapter will Laryvde turn. Huh, I saw a thumbnail pic for the front page link to this chapter in the mobile version but none as such in the desktop version (and no pic in the actual chapter for both mode). Wonders. thank you for the translation and the glorious footnote!